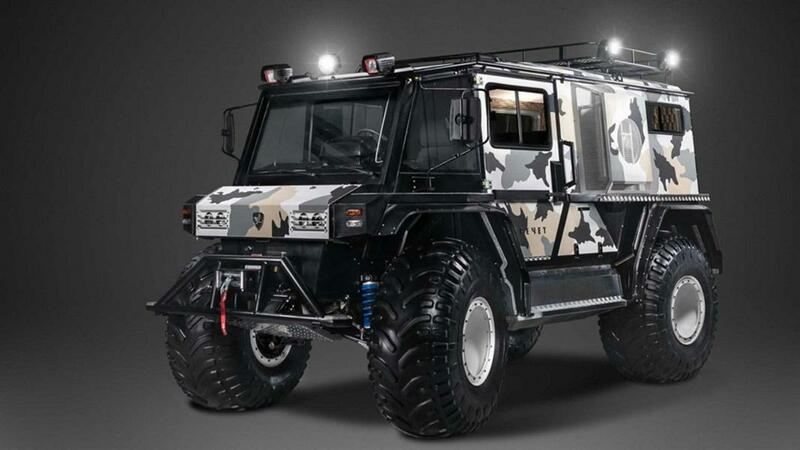 Technoimpulse, a Russian tuner shop, has finally taken the wraps off a formidable custom SUV called the Rocket Z 210-91. Available starting at €75,000, the car is 4.89 meters (16 ft) long, full 2.5 meters (8.2 ft) wide and features 4WD, axle locks and a low-range transfer case. - 101 hp (75 kW) and 170 Nm (125 lb×ft) of torque. The car packs a formidable 60 cm (23.5”) of ground clearance and has two fuel tanks 100 liters each. The interior of the vehicle is rather minimalistic. The only front row seat is the driver’s, located right in the middle. A few people can sleep in the car rather comfortably in case of emergency. Aside from the standard Technoimpulse Rocket Z, the tuner plans to release its six-wheel modification soon.